We refuse to write a complex description for dice. These are 6-siders, and there are six in the package. They are the color of coffee with just enough cream, if you like too much cream in your coffee like SJ does. They have the Munchkin head in place of the 1. Buy them. Kill monsters and take their stuff. 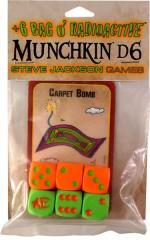 Also includes 4 new cards for Munchkin Apocalypse!